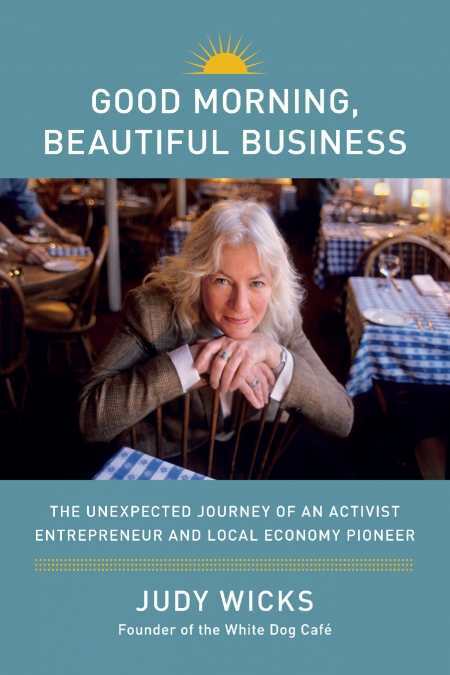 Good Morning, Beautiful Business by Judy Wicks is the memoir of a small business owner who helped revive her community and spread worldwide economic empowerment. Wicks first opened her restaurant, White Dog Cafe, on Sansom Street in Philadelphia in 1983. The restaurant became a beacon in the struggling neighborhood and known internationally for its commitment to farm-fresh, fairly traded, organic food—long before such eating habits were in fashion. Readers will be engaged and invigorated as they watch Wicks succeed with her innovative ideas; they’ll also be inspired as her perspective on the world grows in scope from her restaurant to her city to the whole world. Wicks’ memoir begins far before she opens White Dog Cafe, when she built a fort in the woods at age nine. Readers who are expecting strictly business advice and activism information will wonder why she begins here—but the more literary reader will see that she is examining the power of a sense of place. As a child she felt a strong connection to the woods near her house; as an adult she feels a strong connection to Sansom Street, and eventually the world beyond. Wicks’ memoir does a fantastic job of sharing how she’s learned and grown through her experiences and travels around the world. Readers will be inspired and will learn about the world and business along the way—but the readers who come away the most satisfied by Good Morning, Beautiful Business will be those who never lose sight of the fact that Wicks is a sharing a memoir, a story; her goal is not to create a guidebook (though she has the skills and expertise to accomplish it). Each chapter begins with a short inspirational quotation that matches the theme of the chapter; these quotations, though not central to the text, help cue readers that in many ways this book is more a poetic narrative than practical guide. While it’s a compelling memoir, readers who want to follow in Wicks’ footsteps would benefit more from a how-to book on the subject that uses Wicks’ success as a model, but emphasizes practical steps and advice for readers. Wicks shares her business knowledge and success with readers, but more than that, she shares her heart and her life.